I have a confession. I am on my second child, and I still have no idea how car seats work. Now, before you call Child Protective Services, I assure you, I properly use the car seat every time we go anywhere. But aside from taking it in and out of the base mounted in my car, I am clueless. What if I needed to move my children from my car to a different car in some type of emergency? I have no idea how to install a car seat base, or even how to get the car seat in the car using the belt system. Sadly, I am not even sure I know how to adjust the straps, but at least I am somewhat certain I could figure this one out if needed. Unfortunately I do not foresee a strap emergency anytime in the future. I know kids grow fast, but they will not outgrow their current strap position in the time it takes us to get from home to school or the grocery store. This is partly because so many people make such a fuss about proper child seat installation. 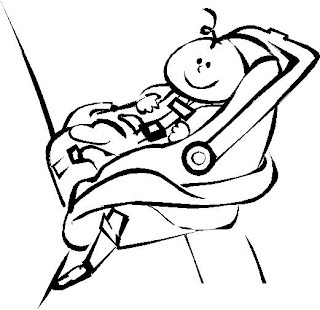 When I was pregnant with my first, my husband and I attended some courses at our local hospital, and one of the lessons was on child seat safety. The man and the manual for the class made it appear that proper child seat installation is akin to advanced astrophysics (a subject I successfully avoided all throughout college). I know I am not alone. I was recently talking to a friend of mine who is on kid number four, and she lamented being in the same predicament. She also has no idea how many of her child safety gadgets work. We realized this is all our husbands’ fault. They are so savvy and good at mechanical things we have no reason to take care of any of this. I really hope my husband is not reading this right now. He may take it as a hint to stop being so helpful, and then I will have to mount our newest convertible car seat (that just happened to arrive today). Hopefully he realizes that if he were to have me install it, he would essentially be compromising our Munchie’s safety, and risking her life. Are child car seats that tricky? Is there a trick to them?